My guys love a good, hearty bowl of pasta, especially if there is some meat or meatballs to go with it. We start our sauce early and let it simmer all day, checking occasionally to see how it’s going, and waiting until all the flavors have bloomed to add salt or pepper near the end. Then we ladle it over a bed of noodles and sprinkle a little Parmesan over it. I have to make large batches so there is enough for lunch leftovers, which I put in the boys’ thermoses, and they check to make sure I add enough sauce and sprinkle in the Parmesan before closing the thermos lid. 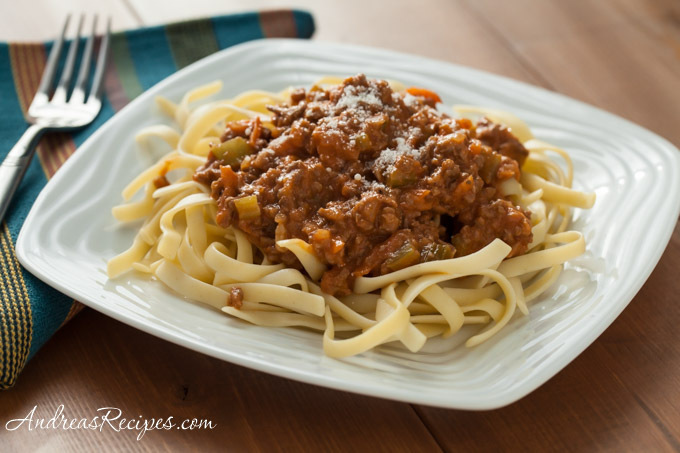 Italian meat sauce (ragù) is the stuff of dreams for this family of sauce lovers. A traditional creamy meat sauce may have cream, half & half, or whole milk in the recipe, which combines with the tomatoes and meat to make a classic Northern-style ragù. For people with lactose-intolerance, like some of my family who developed it later in life, using a lactose-free low-fat milk and an Italian reduced-fat well-aged Parmigiano Reggiano or Grano Padano cheese–both naturally low in lactose–makes this a sauce almost anyone can enjoy. Dealing with lactose intolerance is about finding what works best for you. In the 8-quart stock pot, warm the olive oil and sauté the onions, carrots, celery, and garlic over medium heat until the vegetables are shiny and soft, about 5 to 6 minutes. Reduce heat to a simmer. In the large skillet, crumble the Sweet Italian Sausage and cook over medium heat just until browned but not cooked through, about 5 to 7 minutes. Strain and transfer to the pot with the vegetables and cover. Drain the fat. Repeat with the ground beef, 1 pound at a time. Repeat with the bacon, drain the bacon fat, then deglaze the pan with a little of the wine. Stir the tomato past and lactose-free milk in with the meat and vegetables. Cook covered over medium-low heat for about 1-1/2 hours, stirring occasionally. Stir in the wine and cook uncovered at a simmer for 4 to 6 hours, stirring occasionally. The sauce will be thick and rich. Season with a little salt and pepper to taste and simmer for about 15 more minutes, then serve with cooked fettuccine noodles and grated Parmigiano Reggiano or Grano Padano cheese. This type of thick, rich sauce calls for a noodle that can stand up to it. Fettuccine, or other wide Italian noodles such as Pappardelle, make a perfect match. Sweet Italian sausage has more basil than Mild Italian sausage, and either will work fine in this recipe.